The vision of vast miles of sand dunes – stretching for miles across the desert – was fresh in my mind as our feet sank into the soft sand, still warm from the disappearing sun. 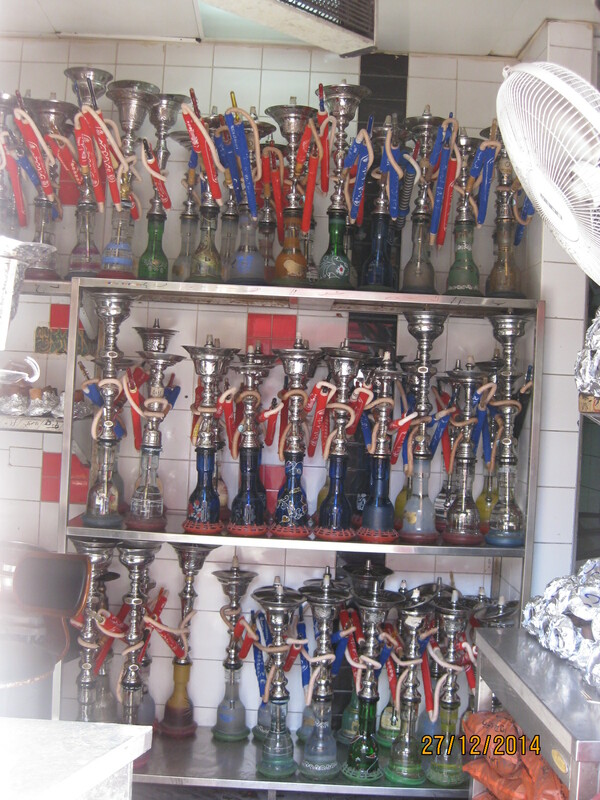 ‘I bet they don’t have many authentic bedouin here, it’s an opportunity to get money from the tourists,’ said Paul. ‘Let’s see,’ I replied as we passed three or four camels, their mouths loosely tied, reined and ready to ride, their pommelled saddles resting on brightly coloured blankets. 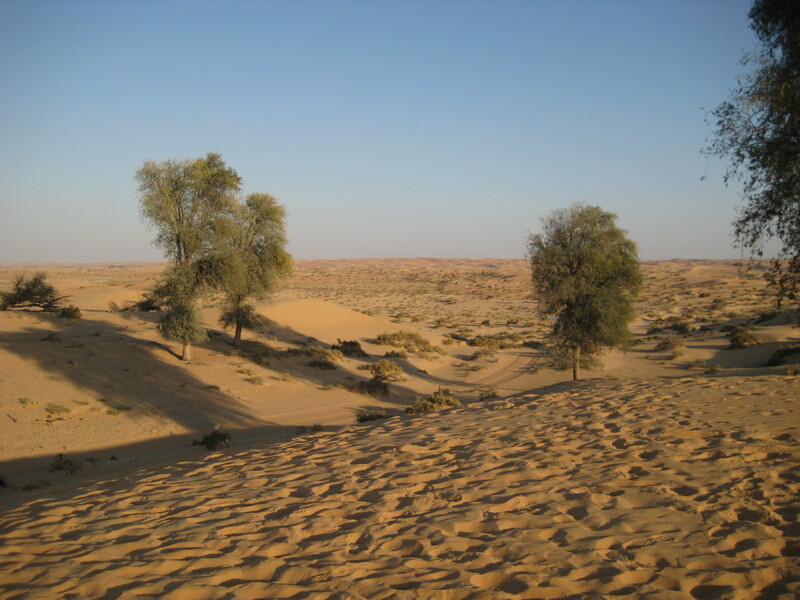 ‘The camels resting near the vegetable souk in the Buraimi Oasis, having crossed the desert with their Bedouin owners – when I was there in 1967 – had a far more interesting life,’ I whispered to Paul. ‘Something smells good.’ We sniffed the air. Dinner was cooking in huge metal cauldrons attended by men in crisp clean robes. One pot contained white rice, another was full of chicken flesh and vegetables, simmering in a deep orange sauce; the distinctive spicy aroma of curry blew in all directions on the evening breeze. An attentive chef proudly spoke. His few English words were difficult to decipher but, moving his arms in a wide circle, he indicated that the main dish was a whole lamb. 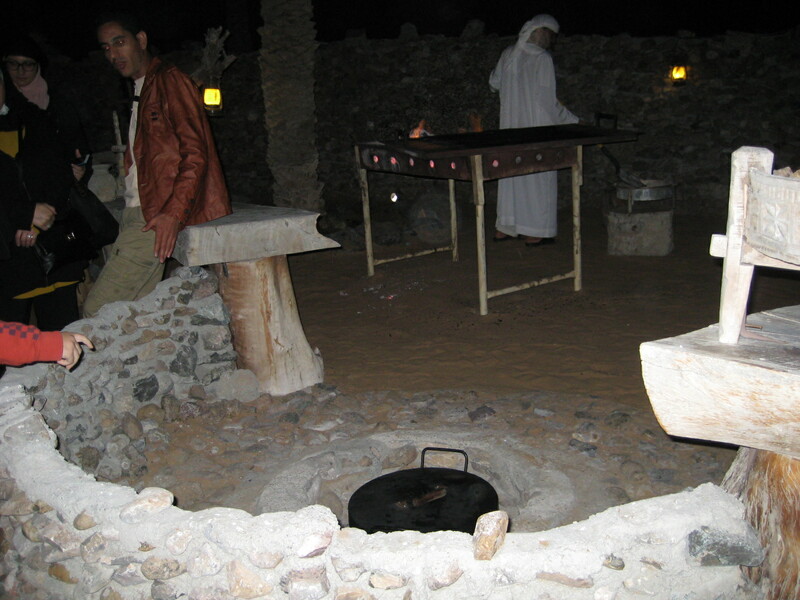 It had been cooking since early morning in the authentic Bedouin manner – in an underground oven. He stepped back to lift the oven top, allowing hot air laced with the delicious fragrance of herbs and spices to rise up above our heads. Walking past the male cooking domain, we reached an Arabic lady wearing a black hijab. She was seated in a circular area, making flat bread, or pita, her nimble hands making it look easy. Nearby, on a long table were containers of fruit juice, water, or camel’s milk that I enjoyed so much I had a second cup. 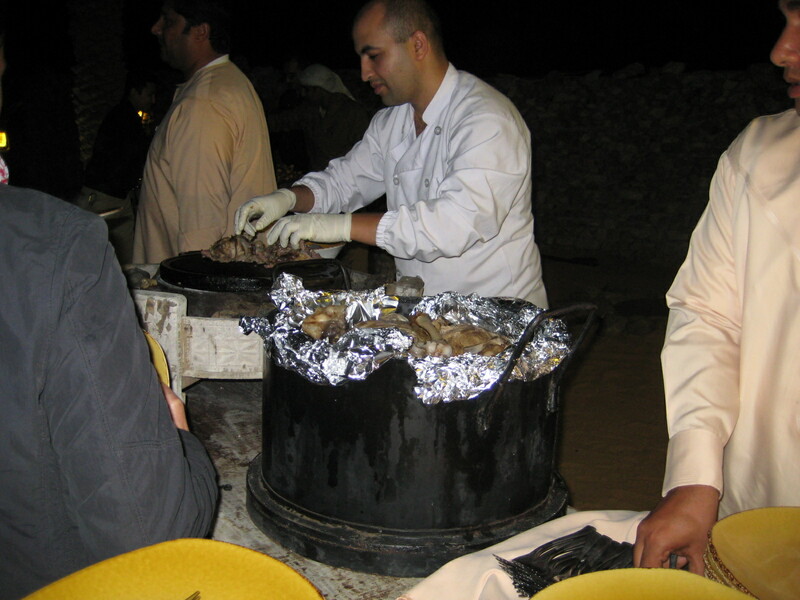 The waiters were informative… explaining that camel’s milk is very rich, and warning that it could cause belching…. and farting! Later, I was glad it hadn’t had that effect on me….. and so was Paul! I learned that camel’s milk contains more vitamins than cow’s milk, including vitamin C, protein and fat, whilst being lower in cholesterol, enabling Bedouin to survive solely on camel’s milk when travelling long distances through the desert. Wondering whether it made them belch or fart, I remembered that in Arabia it is courtesy to belch loudly after a meal: a mandatory sign of pleasure, so probably they welcomed this effect. The lamb had been removed from the underground oven; slices piled high on a serving platter looked tender and appetising. Waiting our turn, we discovered people were from various countries: France, Italy, the US and Australia, many English, and our friends from Brazil. 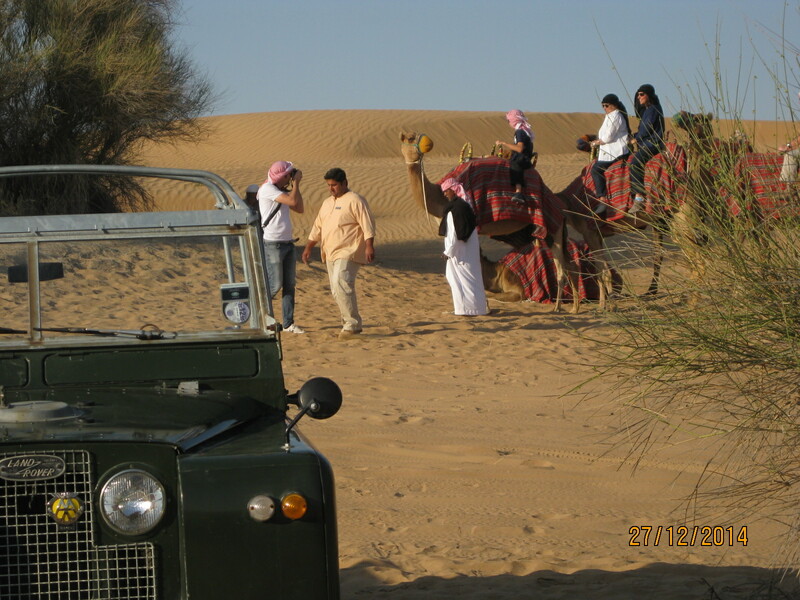 The majority spoke English and they had been collected by car or taxi from various hotels in Dubai city for this desert sojourn. The mood was friendly and expectant. 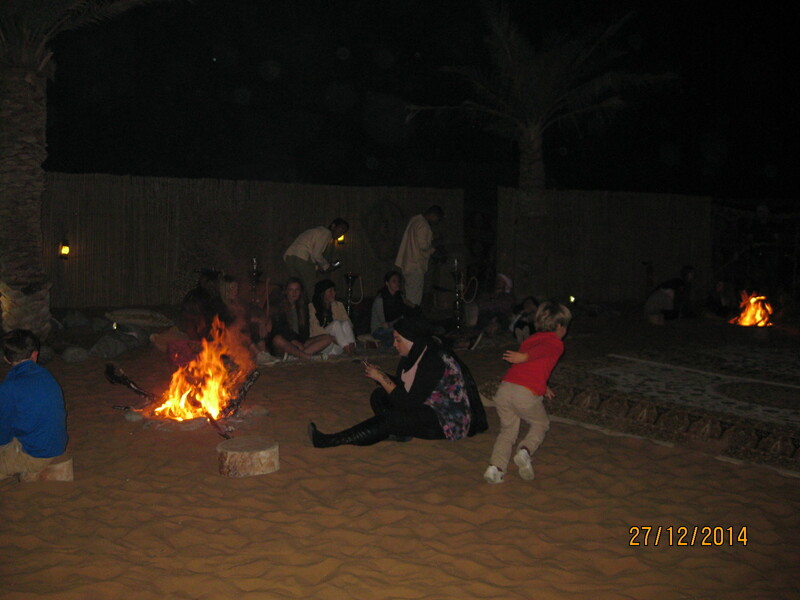 Acknowledging the commercial side of such an evening, most felt it would be fun as well as offering an insight into Bedouin life. We licked our fingers before realising finger bowls also were on the table. ‘I must stop eating. I won’t have space for the main dishes,’ rubbing her generous expanse of tummy. But we did have room and those dishes were splendid, especially the succulent lamb with mouth-watering flavours. To complete the meal Arabic coffee was poured from hand-made brass coffee pots into small porcelain cups that, without handles, resembled large egg cups. Finally, plates of small Baklava – very sweet cakes – were brought by the waiter. By now it was dark. Off centre between the two dining areas flaming torches were being lit and placed around a raised platform; local musicians materialised when we weren’t looking and a male dancer in local dress with long leather boots, leapt onto the stage, brandishing a sword above his head in time to the musical beat. After a while he changed the sword for a wooden imitation rifle that he whirled around his body, up and over his legs and up his back in a typical Bedouin dance. Away from the light, the dark night sky was full of stars. Outside the white fort walls, listening to the desert silence, we stood a while, picking out the Plough, Jupiter and Saturn shining clearly and twinkling, enjoying this quiet moment together. The fast sound of gypsy music grew louder as we returned to see a dancing lady in a brightly coloured blouse. Her bare feet beat the stage as she flicked her long tiered skirt from side to side and back to front. The rhythm increased with the booming beat until she bent forward from the waist with her head so low that her long brown hair reached the ground. Her head swung swiftly from side to side, her hair whipping about. The movements gained momentum, her feet beat faster and louder, hands quickly clapping, arms twisting, as she reached the final crescendo, throwing her head back to rounds of appreciative applause. The air was cooling, the evening breeze picking up. At our table some of the Brazilian contingent had left, making their way towards the parked vehicles outside. Those remaining sat, eyes closed, leaning against each other. I supposed Paul was chatting somewhere. Whilst waiting I took a walk, committing to memory the night scene: once flaming torches around the stage now dead, burnt out; busy waiters in white shirts – less fresh than when the evening had started – collected screwed up paper serviettes and other debris from the fast emptying tables. There, in the central area, I spied Paul. He was sitting askew on one of the cushions that formed a comfortable rectangle, smoking one of the Shisha, or hubble-bubble, pipes set out and ready for use. ‘Everyone’s making for the Land Rovers,’ I said. ‘That was very pleasant,’ Paul spoke softly. ‘A relaxing five minutes,’ rising slowly from the cushion. ‘Five minutes?’ I replied, chuckling. ‘More like twenty, you looked as if you were in a trance….and I have evidence,’ tapping my camera. We laughed. 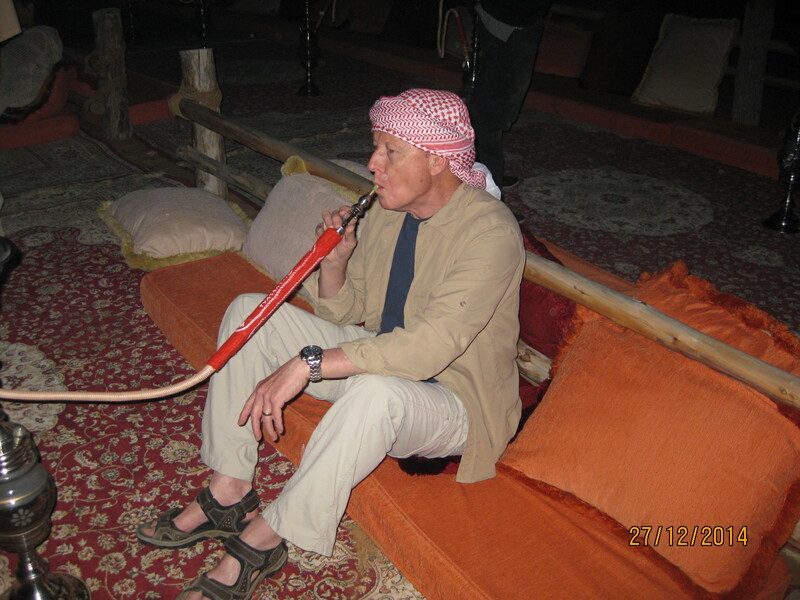 While Paul had been experimenting with the shisha, the evening had been winding down. 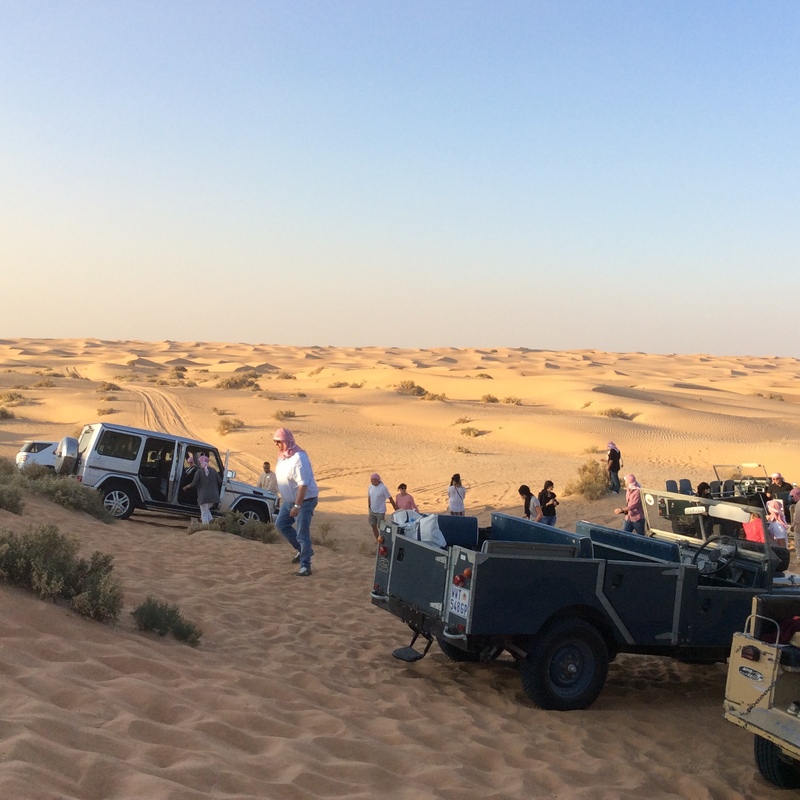 It was time to reposition our head-gear and return to our classic 1950’s open Land Rovers to speed through sand dunes lit only by headlights. Arriving back at the entrance to the Reserve, we swiftly swopped vehicles. It was warm and comfortable inside the People Carrier. 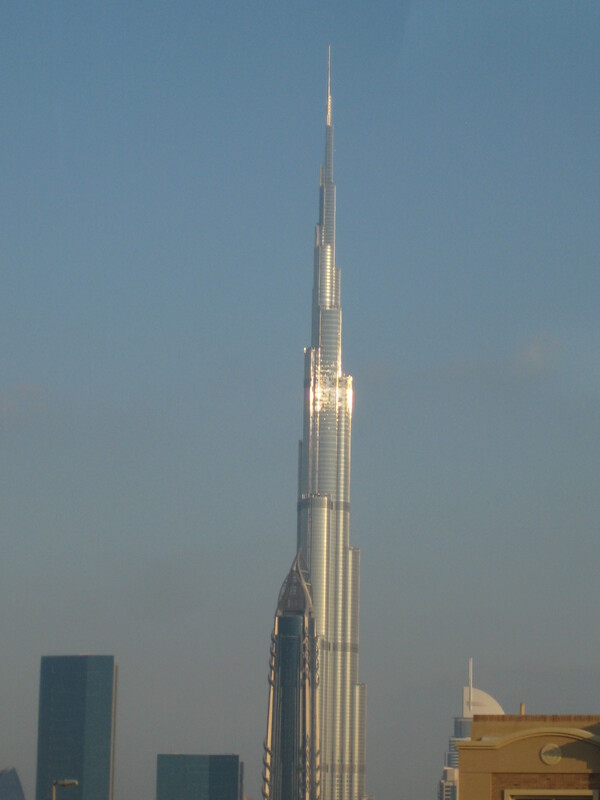 We were driven along deserted dual carriageways on our way ‘home.’ Tall buildings stood either side, until the tallest building in the world and symbol of modern-day Dubai – the Burj Khalifa – appeared on the horizon, and we were returned safely from the Bedouin’s desert encampment to our modern glass skyscraper hotels. 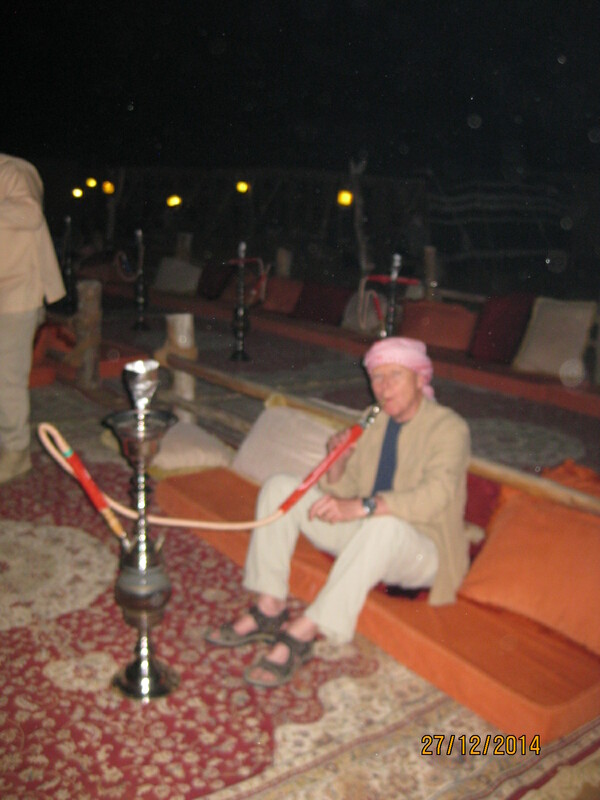 Yes, we moved from Bahrain to the Buraimi Oasis in Abu Dhabi where we sampled Bedouin hospitality and feel privileged to have been in those countries in the 1960’s.